Statista is a German online portal for statistics, which makes data collected by market and opinion research institutes and data derived from the economic sector and official statistics available in English, French, German and Spanish. It is one of the most successful statistics databases in the world According to the company, its platform contains more than 1,000,000 statistics on more than 80,000 topics from more than 22,500 sources. The company states that it covers 170 different industries. According to Statista, the platform has more than 1.5 million users and generates a revenue of about €50 million. Apart from statistics, Statista also provides data on market forecasts, white paper studies, dossiers, industry reports, digital market outlooks and consumer market outlooks. The company was founded by Dr Friedrich Schwandt and Tim Kröger in 2007, and it currently has more than 600 employees, including database experts, writers and statisticians. Statista does not only provide data in German but also in English, French and Spanish. Statista's head office is located at the Brahms Kontor in Hamburg; the company also has offices in New York, London, Paris and Singapore. According to Statista, the portal's data partners include the Federal Statistical Office of Germany (Destatis), the Allensbach Institute (IfD Allensbach), the OECD, the German Institute for Economic Research (DIW Berlin) and Bürgel . There are also partnerships with WELT, T-Online and the Handelszeitung. 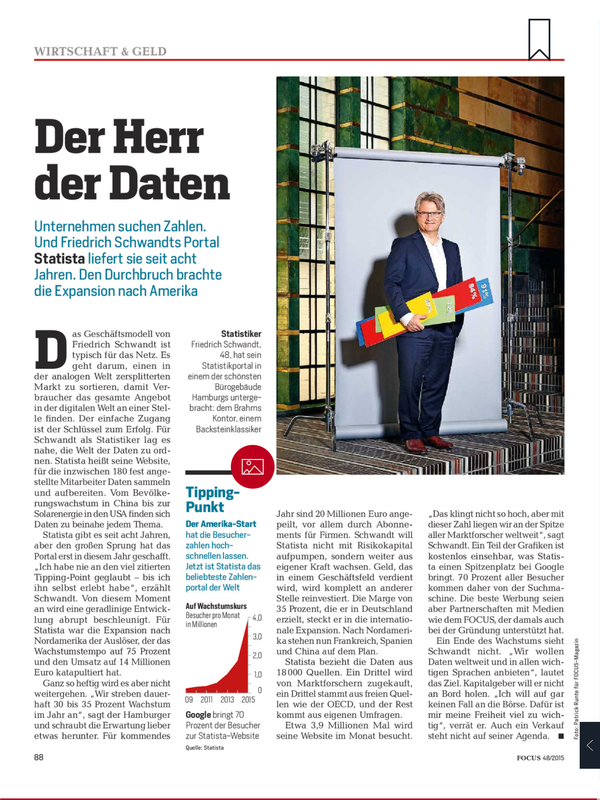 The web site deutsche-startups.de named Statista "Start-up of the Year" in 2008 and in the same year, the company was among the winners of the start-up competition "Enable to Start", sponsored by the Financial Times Germany. In 2010, the initiative "Deutschland – Land der Ideen" (Germany – Land of Ideas) selected Statista as one of the winners in the category "Landmarks in the Land of Ideas 2010". and awarded the European Red Herring Prize. Moreover, the company was awarded the European Red Herring Prize 2010. In 2012, Statista was nominated for the German Entrepreneur Award in the category "Fast Climber" , and in 2014, it was named Best Database by the Library Journal . At the end of 2015, Statista was bought by advertising company Ströer Media. The company provides statistics and survey results, which are presented in charts and tables. Its main target groups are business customers, lecturers and researchers. The data provided by the company cover, among other things, advertisement, buying behaviour or specific industries. Statista offers both free and paid content. In order to be able to use the data further, you need to register as a user, but diagrams can be viewed without registration. Users also have access to the Digital Market Outlook, the Consumer Market Outlook and the Mobility Market Outlook, which are based on demographic and economic data and give detailed insights into the development of the respective market. In-depth analyses of consumer behaviour and media usage can be carried out with the help of the Global Consumer Survey. In addition to numerous individual statistics, there is a study database containing more than 41,000 studies . Customers can also contact Statista's Research & Analysis department to commission specific surveys, and the company produces individual infographics, videos or presentations and publications. Since the end of 2011, Statista produces free infographics, which are published on a regular basis on news sites on current subjects from the areas of media and technology for downloading. These graphics are used by websites like Mashable, Business Insider or VentureBeat. ^ Müller, Martin U. (14 October 2015). "Hamburger Start-up Statista: Balken, die die Welt beschreiben" – via Spiegel Online. ^ "Statista - The Statistics Portal". Statista. ^ a b "Statista - The Statistics Portal". Statista. ^ "Statista ist das Start-up des Jahres - deutsche-startups.de". 15 December 2008. ^ "Deutschland Land der Ideen 2010". Archived from the original on 2012-02-12. ^ "Red Herring Europe Winners 2010". Archived from the original on 2014-07-14. ^ "Statista - eDesiderata". www.crl.edu. ^ Silverman, Matt. "Encyclopedia Britannica vs. Wikipedia [INFOGRAPHIC]". Mashable. ^ "This Year's Forbes World's Billionaires List In One Simple Infographic". Business Insider. ^ "Yahoo's fallback position: Hey, at least we're not AOL (numbers) - VentureBeat". venturebeat.com.